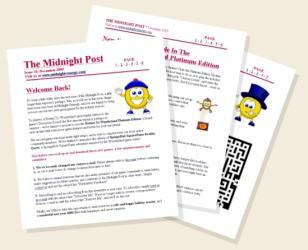 Welcome to The Midnight Post, the free Midnight Synergy newsletter service. Get the latest game releases, free game updates, free puzzles, articles, and other great content. Subscribing to and un-subscribing from this newsletter is very easy. Simply fill out your e-mail address below, and we'll do the rest. Your e-mail will never be shared, and there's absolutely zero spam. Just free software updates, free puzzles, and other game news. The Ultimate Edition Games Collection DVD, and spotlights on the new level archives. Wonderland Adventures Editor Update, Z-Bot Retro Connections, and a new edition of Peegue's Puzzle Page. Wonderland Adventures Planet of the Z-Bots released! Also includes Chuck's Challenge, a new Wonderland Gallery, Questions for Midnight Synergy, and a new edition of Peegue's Puzzle Page. Marking the tenth anniversary of the Wonderland Games. A new edition of the Wonderland Gallery, a spotlight on Hyper Princess Pitch, and Peegue's Puzzle Page vol.23. Wonderland Adventures Planet of the Z-Bots Sneak Peek, Nintendo DS Games, Midnight Synergy Vault: Buzz-Off, a strange message, and Peegue's Puzzle Page vol.22. Wonderland Illustrations, Return To Wonderland Arcade Games, Community Spotlight, Retro Gaming videos, and Peegue's Puzzle Page vol.21. Wonderland Adventures - The Retro Connection, The Wonderland Archive's new home, a 2008 retro-remakes introspection, and Peegue's Puzzle Page vol.20. The Top Ten Free Games of 2008, a Midnight Synergy update, an Intensity XS retro introspection, and Peegue's Puzzle Page vol.19. Wonderland Adventures: Mysteries of Fire Island is released! Also: A new Wonderland Gallery, Community Spotlight, Star Wars Arcade restropective, and Peegue's Puzzle Page vol.18. Jump Jump Jelly Reactor, a Mysteries of Fire Island update, Community Spotlight, Donkey Kong restropective, the Midnight Synergy Vault, and Peegue's Puzzle Page vol.17. Astro Avenger II, DarkSide, Questionaut, Shift2, a Wonderland Adventures Update, Community Spotlight, ROM Check Fail, and Peegue's Puzzle Page vol.16. Jasper's Journey, Madame Fate, Making of Wonderland Adventures (Part 3), Wonderland Adventures Updates, Pirate Quest, and Peegue's Puzzle Page vol.15. The Ten Best Freeware Games of 2007, Making of Wonderland Adventures (Part 2), Wonderland Community Update, R-Type Retrospective, and Peegue's Puzzle Page vol.14. The Wonderland Fifth Anniversary Extravaganza! Wonderland Adventures Editor, Wonderland Community Update, Chomper Interview, and Peegue's Puzzle Page vol.13. Azada, Mr. Robot, Ricochet Infinity, Atari 2600 Spotlight and Retro Challenge, Wonderland Community Update, and Peegue's Puzzle Page vol.12. Titan Attacks, Professor Fizzwizzle and the Molten Mystery, Wonderland Gallery Update, Ultima Retrospective, and Peegue's Puzzle Page vol.11. Chocolate Castle, Frogger Flashback, Wonderland Community and Gallery Updates, and Peegue's Puzzle Page vol.10. Wonderland Adventures Release and Free Demo, Retro Spotlight: Adventure 2600, Wonderland Gallery, and Peegue's Puzzle Page vol.9. Wonderland Adventures Gameplay Video, Archon Retrospective, Fizzball, Community Update, and Peegue's Puzzle Page vol.8. A new Development Update on Wonderland Adventures, a Commodore 64 retro extravaganza, Halloween Feature, and Peegue's Puzzle Page vol.7. Development Update on Wonderland Adventures, The Grow Series, Zork Retrospective, Coin Quest Feature, and Peegue's Puzzle Page vol.6. The Midnight Synergy Games Collection CD-Rom, Dragon's Lair Retrospective, "tricksy" Wonderland levels, and Peegue's Puzzle Page vol.5. Four Free Games, Chip's Challenge Retrospective, Interview with Chuck Sommerville (Designer of Chip's Challenge), a quick Wonderland development update, Peegue's Puzzle Page vol.4., and some grand illusions. A Sneak Peek at the next Wonderland game, Four More Great Games, Community Spotlight, and Peegue's Puzzle Page vol.3. Return To Wonderland Platinum Edition, SpongeBob SquarePants Krabby Quest, Community Spotlight, and Peegue's Puzzle Page vol.2. Wonderland Secrets, Community Spotlight, Peegue's Puzzle Page vol.1, and the iLoof nano.